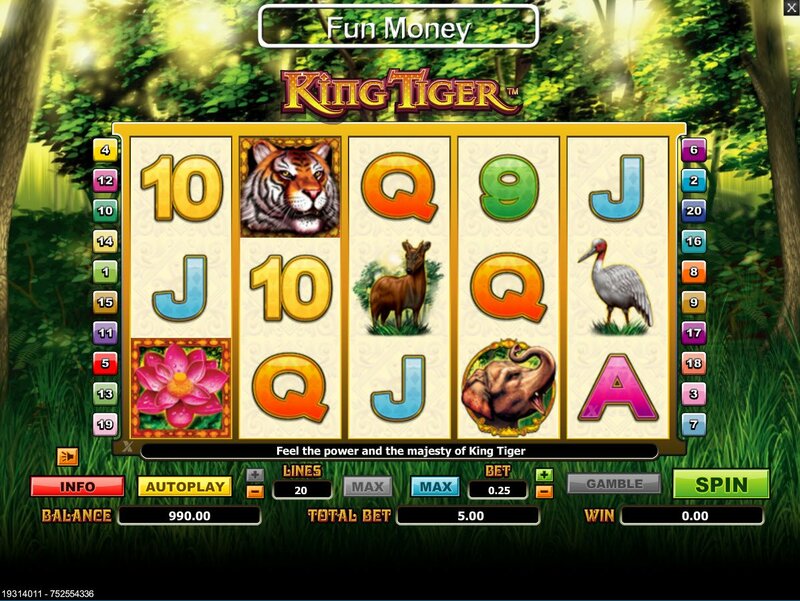 In the war between the tiger and the flower, the tiger will obviously win the title of king, but the flower has some power up its sleeve too – it is the key to free spins and multipliers. While the graphics are bright and clear, the animals are slightly convoluted, but for the winning potential alone, this game is worth a go. It starts with am angry looking tiger, and an equally enraged bull. Is the bull going to challenge the tiger for its Kingly duties in the jungle? Let's find out in the King Tiger slot review. There are 5-reels and 20-paylines, surrounded by luscious green forest, with grass growing beneath. Reels roll better when they are on nature's own green grass. Hear the tiger roar when he is part of a winning line! Not just clear and bright visuals in the King Tiger slot game, but also nice little audio bites to entertain you as well. 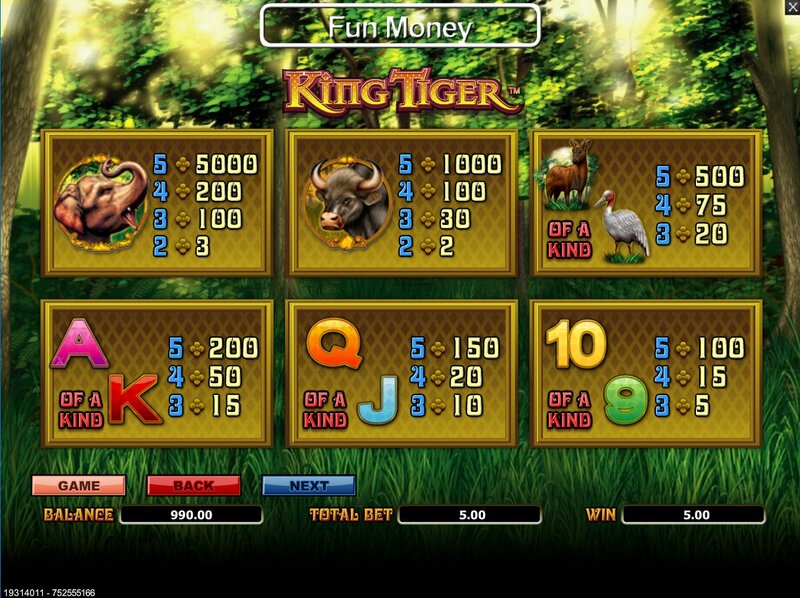 The King Tiger slot bonus scatter symbol flower blows with the wind to add a few extra coins to your wagering pot. There are a range of random animals that seem to have no rhyme or reason to be in the jungle, or forest. Not that I think tigers live in the forest. Unless they do, then I totally knew that and was just pretending. In a war between a tiger and a flower who would win? A rose by any other name would smell as sweet, but then a wild tiger's wrath is liable to crush and scatter the flower symbol. The wild tiger symbol appears on Reels 2, 3 and 4 and will substitute for all symbols except for his nemesis. The tiger will increase the chances of you winning your wager. 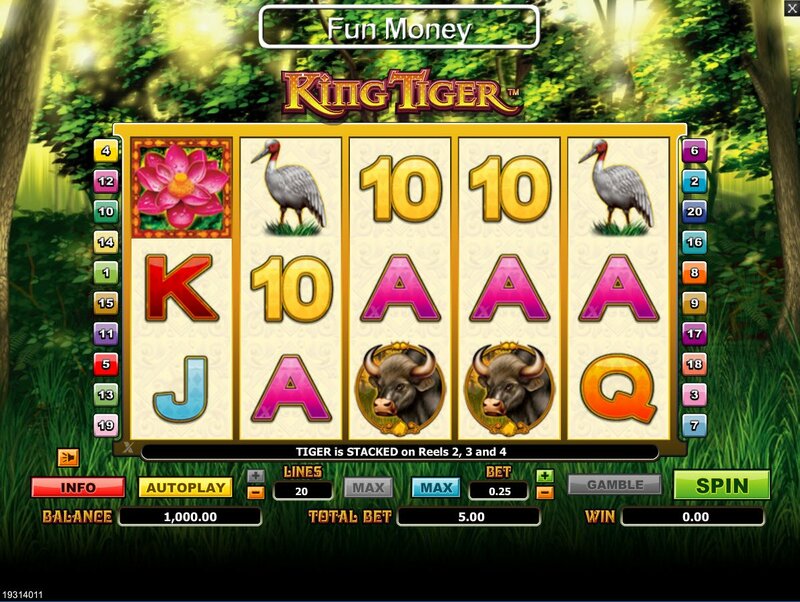 The King Tiger slot bonus scatter symbol flower blows with the wind to add a few extra coins to your wagering pot. There is also the gamble feature, which I always enjoy as a bit of extra spice to a slot game. If you guess the correct suit colour, you'll have your win doubled, and if you guess the right suit, your win will be quadrupled.